When it comes to camping, the first thing that you need to consider is the quality and comfort of your sleep. A good night’s sleep is essential if you want to fulfill your planned activities the following day in the mountains. Therefore, choosing the best camping cot tents is crucial. It comes in a variety of shapes, materials, sizes, and styles. 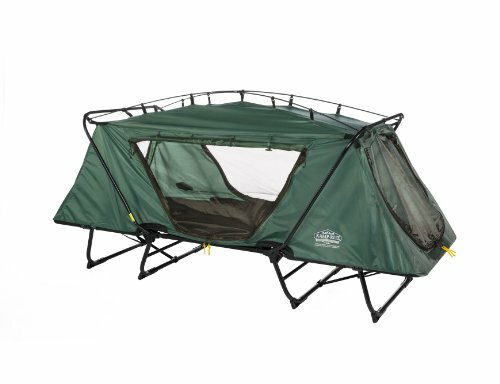 The perfect tent cot will take your camping to the next level. This Kamp-Rite oversize tent cot is made of quality nylon. Thanks to its elevated sleeping platform, you will not wake up with a backache. It also keeps you safe from insects and snakes in the ground. The heavy-duty 210D tent and rain fly can protect you even in heavy rain. No matter the weather, this tent will shield you from the harsh elements of nature. In addition to this, its versatile design allows the cot to function as a flat cot, a lounge, or a simple camping chair. It is sure to provide a platform for you to rest no matter what you do in the woods. Its simplistic design allows you to set it up in less than a minute. The Tangkula tent cot offers optimal comfort when sleeping outdoors. 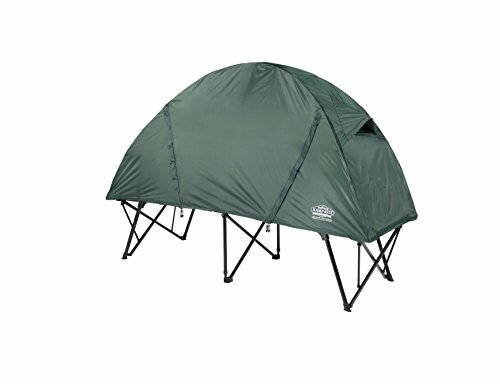 It is made of heavy-duty 420D PU coated oxford tent. The rain fly protects you from the harsh weather outside. This cot has a huge D-shaped screening door with zipper for easy access. It also features a foldable design that folds flat when not in use. You can store it at the back of your car without consuming much space—an ideal camping gear. The robust aluminum frame of the tent cot is moisture-proof, and it’s elevated 12 inches from the ground. In that way, you don’t have to suffer from insect bites when you wake up in the morning. It also prevents dampness and sharp rocks from harming your skin. The breathable micro mosquito mesh lets the air inside the cot and improves the air circulation. The package includes an easy-to-follow manual. It is easy to assemble and will only take a few minutes of your time before you can use the tent cot. 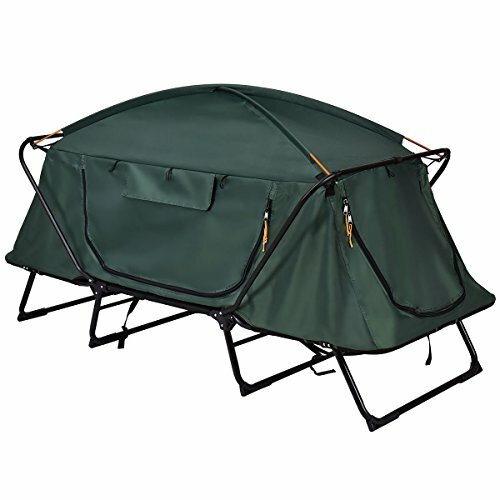 The Ozark tent cot is ideal for those who are looking for a two-person cot tent. It features a mesh curtain to protect you from bugs and insects. It’s a little heavy, but it can fit inside the back of your car. The package includes a gear loft and rainfly for weather protection. The elevated padded cot keeps sleeping at night more comfortable. You can remove the rainfly if you want and the included gear loft makes it easier to organize your stuff. Sold at an affordable price, you can enjoy camping without suffering from the back aches from sleeping on the ground in the morning. Another budget-friendly tent cot in our list is the Jet Tent Bunker XL camping cot tent. This is a 100% waterproof cot. The package includes rain fly to keep you safe from the harsh weather. It is made of Khaki green ripstop polyester and a virtually rip-proof for your protection. The PVC coated polyester bed is fully padded and provides optimal comfort when you’re sleeping. 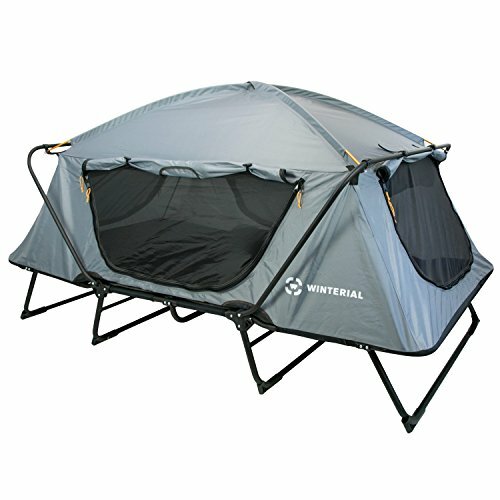 It also features a durable cross-leg stretcher and three-sided vestibule area. It only weighs 33 pounds, making it easy to carry around. The maximum capacity of this tent is 330 pounds. The package includes a waterproof carry bag for easy transportation. If you are looking for a family-sized tent cot, you should check out the Winterial double outdoor tent cot. The elevated padded bunker provides you comfort as you sleep. Even with its vast size, you can set it up in just a few minutes. The collapsible aluminum frame can handle up to 500 pounds. It is made of heavy-duty nylon fabric with four windows to improve the air circulation inside the tent. It has an insect free mesh lining, keeping away the bugs and insects from entering. Also, its advanced outdoor design with rain protection will shield you even from heavy rain and snow. Weighing only 44 pounds, you can carry it anywhere with ease. 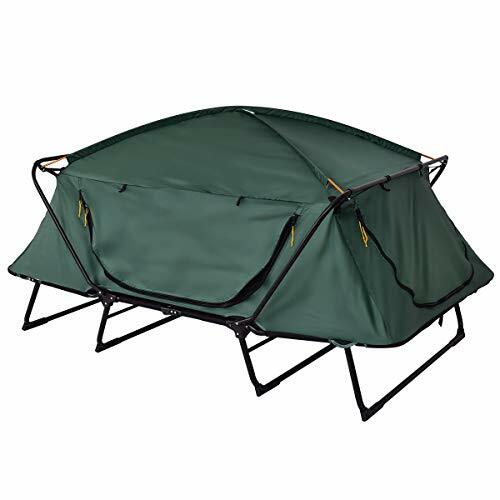 Another product from Kamp-Rite, we have the compact tent cot in army green. This collapsible tent with an integrated cot makes it comfortable to sleep at night when you’re in the mountain. You can separate the cot, and the tent for independent use or you can zip it together for combined use, whichever you may need. It is made of heavy-duty weatherproof 210D nylon construction with taped seams will serve you for years camping. The no-see-um mesh on doors and windows keeps the insects and bugs away. The zippers can resist rust and corrosion. You can set it up in less than one minute, and its lightweight design makes it easy to carry anywhere you want. If you’re looking for a more affordable product from Kamp-Rite, you should check out this nylon tent cot. Its lightweight aluminum frame can support up to 300 pounds and can be folded flat for easy transportation. You can use this as a cot at night and a lounge chair by the morning. The package includes a massive duty case. The high pad is 11 inches off the ground. Its patented design is used by the US military for comfort outdoors. Now you can use this for your upcoming camping trips. All windows and openings feature a corrosion resistant nickel sliding zippers. You don’t need to burn a hole in your pocket to experience optimal comfort when camping! 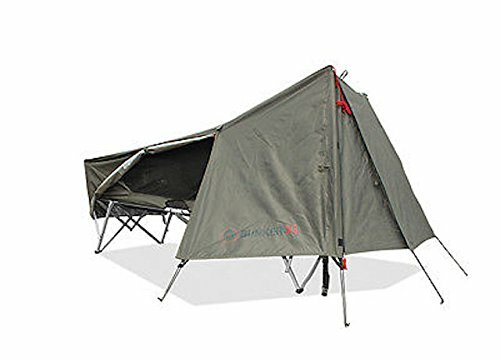 The Tangkula tent cot is made to provide durability and comfortability. It is made of heavy-duty 420D PU coated oxford and 600D waterproof oxford to provide optimal protection from the harsh elements of nature. It also has a solid D-shape screening door with zippers, providing easy access. The tent does not consume much space, and it’s lightweight. It is an ideal camping gear if you like hiking or camping. A carrying bag is included in the package, so you can store it when not in use. It’s moisture-proof, and its solid aluminum frame will keep you 12 inches off the ground. The breathable micro mosquito mesh keeps bugs and insects away. This camping tent from Heavens TVCZ is ideal for people who love camping and hiking. 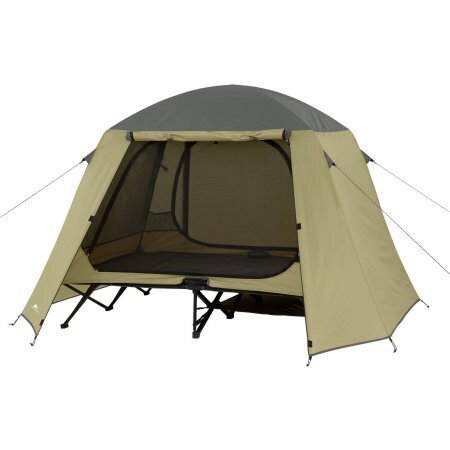 It is made of heavy-duty 420D PU coated oxford tent. The rain fly protects you from the most torrential rain. The lightweight aluminum frame elevates you off the ground for a comfortable sleep. There are two sizeable D-shape screening doors for easy access to the cot. It also has a breathable micro mosquito mesh to keep insects away and improve air circulation. Its versatile design will let you use it as a flat or tent cot. Setting up the tent is a breeze. 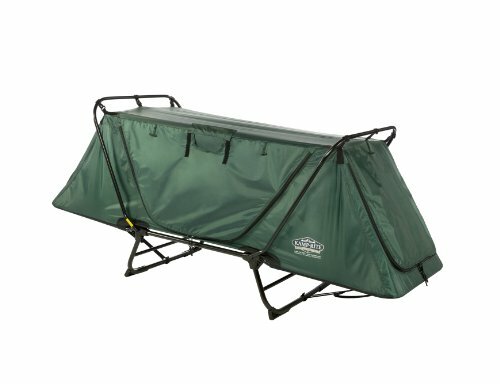 In army green color, this tent cot will be your buddy for more camping trips to come.